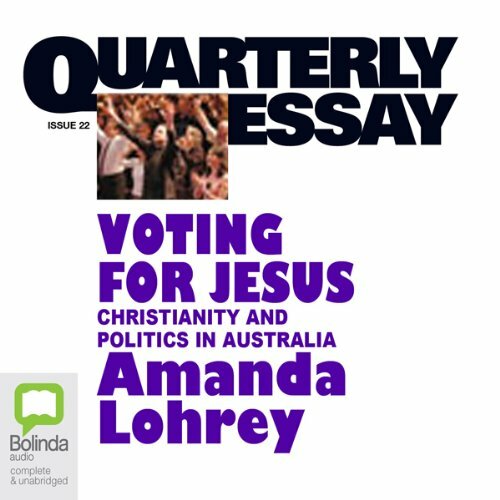 "Voting for Jesus" is also an essay about the use and abuse of religion in party politics. Examining the success of Family First, Lohrey argues that Christians in politics have far less influence than they would like - the government uses them when convenient and otherwise disregards them. Blending individual interviews with political argument, she makes a subtle case for the blessings of secularism and the variety of spiritual encounters it makes possible. Would you consider the audio edition of Quarterly Essay 22 to be better than the print version? It was written in such a way that it converted well to an audio book. What was one of the most memorable moments of Quarterly Essay 22? Would recommend this book to anyone interested in Australian politics.